Thomas Paine was an English-born (February 9, 1737) American political activist, philosopher, political theorist and revolutionary. One of the Founding Fathers of the United States, he authored the two most influential pamphlets at the start of the American Revolution and inspired the patriots in 1776 to declare independence from Britain. His history began with the writing of Common Sense 1, a pamphlet advocating independence from Great Britain. Written to people in the Thirteen Colonies and in clear but persuasive prose, Paine marshaled both a moral and political argument to encourage common people in the Colonies to fight for the principles that all people are equal and deserve equal rights and opportunities. Common Sense was published anonymously on January 10, 1776, at the beginning of the American Revolution, and became an immediate sensation. It was sold and distributed widely and read aloud at taverns and meeting places. In proportion to the population of the colonies at that time (2.5 million), it had the largest sale and circulation of any book published in American history. As of 2006, it remains an all-time best selling American title, and is still in print today. Common Sense made public a persuasive and impassioned case for independence, which before the pamphlet had not yet been given serious intellectual consideration. 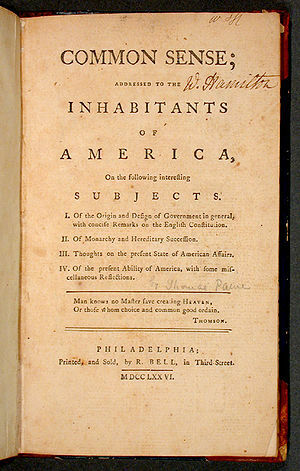 Paine connected independence with common dissenting Protestant beliefs to present a distinctly American political identity, structuring Common Sense as if it were a sermon. Paine’s ideas reflected the idea of transnational human rights. 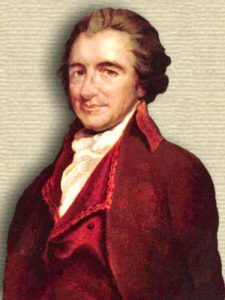 Born in Thetford in the English county of Norfolk, Paine migrated to the British American colonies in 1774 with the help of Benjamin Franklin, arriving just in time to participate in the American Revolution. Virtually every rebel read (or listened to a reading of) his powerful pamphlet Common Sense, helped crystallize the patriotic demand for independence from Great Britain. Common Sense was so influential that John Adams said: “Without the pen of the author of Common Sense, the sword of Washington would have been raised in vain”. After the American Revolution, Paine lived in France for most of the 1790s, becoming deeply involved in the French Revolution. He wrote Rights of Man (1791), in part a defense of the French Revolution against its critics. His attacks on Irish conservative writer Edmund Burke led to a trial and conviction in absentia in England in 1792 for the crime of seditious libel. The British government of William Pitt the Younger, worried by the possibility that the French Revolution might spread to England and had begun suppressing works that espoused radical philosophies. Paine’s work, which advocated the right of the people to overthrow their government, was duly targeted, with a summons for his arrest issued in early 1792. Paine fled to France in September where, rather immediately and despite not being able to speak French, was elected to the French National Convention. In December 1793, he was arrested and was taken to Luxembourg Prison in Paris. While in prison, he continued to work on The Age of Reason (1793–1794). Future President James Monroe used his diplomatic connections to get Paine released in November 1794. He became notorious because of his pamphlets The Age of Reason, in which he advocated deism, promoted reason and free thought and argued against institutionalized religion in general and Christian doctrine. This would permanently impact history’s opinion of Paine. He published the pamphlet Agrarian Justice (1797), discussing the origins of property and introduced the concept of a guaranteed minimum income. In the Agrarian Justice, Paine lobbied for a tax to be placed on all land owners to be used in support of those who did not own land. In 1802, he returned to the U.S. where he died on June 8, 1809. Only six people attended his funeral as he had been ostracized for his ridicule of Christianity and movement to socialistic philosophies.